Thasos also found that malls with so-called experiential tenants that aren't just focused on selling products, like Apple, Italian food hall Eataly and Tesla, haven't been drawing in extra traffic. As retailers are now starting to talk about pulling back on discounting, this could be one reason why traffic is dropping at malls, he said, in addition to the fact that some purchases are moving online. Another issue is landlords have been hoping that offering shoppers new experiences would make it more exciting to go to the mall, but the early evidence isn't showing a boost in activity. U.S. retailers so far have announced they will shut 5,994 stores, while opening 2,641, according to real estate tracking done by Coresight Research. That's more locations slated to go dark than during last year. In 2018, there were 5,864 closures announced and 3,239 openings, Coresight said. "I expect store closures to accelerate in 2019, hitting some 12,000 by year end," Deborah Weinswig, founder and CEO of Coresight, said. "The slowdown we saw in 2018 seems to have been a brief respite in what's a steady, long-term trend." "It's funny because none of the retailers [closing stores] are surprising," DJ Busch, analyst at commercial real estate services firm Green Street Advisors, said. "But when it happens in a wave, it disrupts negotiating power. It creates a soft point." His firm found malls with so-called experiential tenants that aren't just focused on selling products, like Apple, Italian food hall Eataly and Tesla, haven't been drawing in extra traffic. 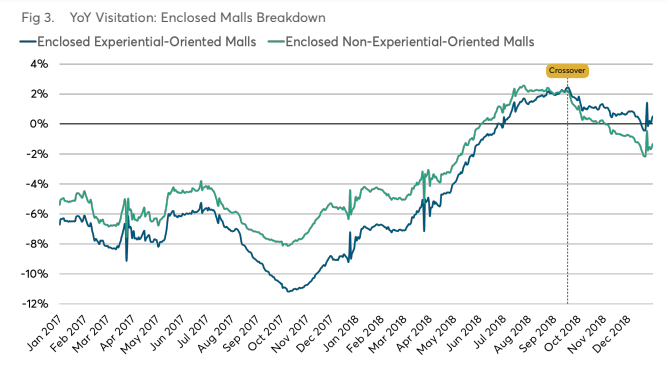 Up until the final three months of 2018, indoor shopping malls with "experiential" tenants didn't benefit from greater shopper traffic on a year-over-year basis when compared with indoor malls without any of those unique, nonapparel tenants, Thasos said. Mall owners are also experimenting with spaces that let young brands rotate in and out frequently, where they sign short-term leases and gain access to data on foot traffic and shopping patterns. Macerich, the third-largest mall owner in the nation, has a business called BrandBox that it's rolling out at its centers across the U.S.
"I think this is a multiyear transition," Busch said. "Cleanse out some of these retailers that lasted longer than they should have. ... It's going to be tough. Anyone who thinks otherwise is too optimistic. But it doesn't mean this is a dead business. ... It can continue to be a good business as underproductive [retailers] go away, and the strong landlords invest."